If you’re like me, you’ve noticed that prices on Amazon seem less stable than those in brick and mortar stores. There have been times I’ve visited Amazon for a specific product, noted the price, and when I checked back in two days later, the price had changed significantly. Check again a week later, and it’s different still. Until recently, this was just anecdotal for me. I wasn’t sure if what I thought was true was really true. Then about a month ago, I decided to conduct a little experiment using some of my favorite graphing calculator models. Every hour for an entire month, I’d collect the Amazon price for these graphing calculators to see how they change over the month to confirm or refute my suspicions. The results are now in, and they are more surprising than I could have imagined. Not only do graphing calculator prices for Texas Instruments, Casio, and HP fluctuate, in some cases they do so on dramatic scales and on an hour by hour basis. It’s possible that if you bought a calculator on a Tuesday a 3 p.m. and your friend bought at 4 p.m., you might have paid as much as 30% more (or less, of course). Since it is virtually impossible to sell an item on Amazon without the buy box, you will sometimes see deep discounting from 3rd party sellers to try to claim the buy box from Amazon so that they can move product. 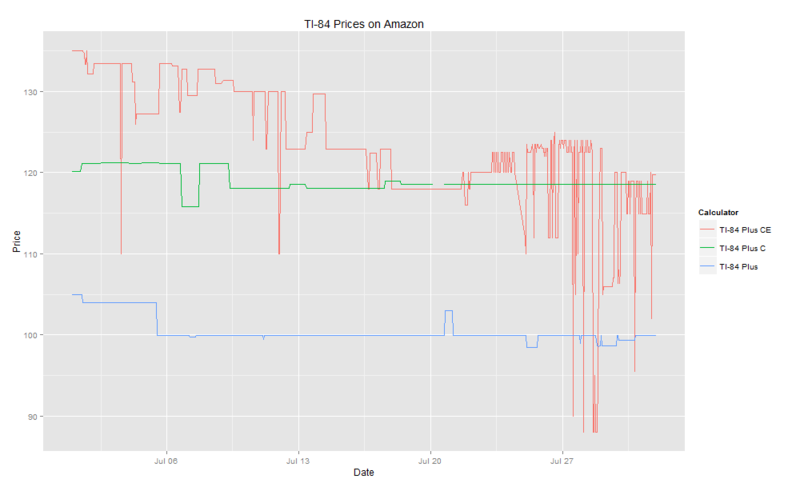 In the case of the TI-84 Plus CE, the wild fluctuations were a result of Amazon dramatically dropping the price below $90 in July. Prior to July, they had maintained a relatively stable price on that calculator. Since this calculator has 80 3rd party sellers all competing for sales, you may see a 3rd party seller who is dramatically undercutting Amazon just so they can claim the buy box. As you read through the graphs that follow, keep in mind that if you’d like to take advantage of this interesting pricing phenomenon, you can do so by following my Twitter feed. I’m working towards setting up my Twitter feed to Tweet when there are significant price drops on graphing calculators on Amazon (if I succeed, I’ll limit the number of daily and weekly tweets to a small number I send so I don’t spam tweet everyone). Clicking on any of these graphs will launch a much larger version in a new window that you may find easier to read, depending on your screen size, whether you are viewing this post on a mobile device, etc. While there are many TI-84 Plus models available, I focused on 3: the classic TI-84 Plus black, last year’s TI-84 C, and the all new for 2015-16 TI-84 Plus CE. This was easily the most interesting grouping I have data for. As you can see the TI-84 Plus CE price varies wildly, sometimes careening up and down by nearly $40 in an hour. Unfortunate buyers paid $135 at the beginning of the month. Lucky buyers got in at a low of $88. See the current Amazon prices on the TI-84 Plus CE, TI-84 Plus C, TI-84 Plus, or read my TI-84 Plus CE review. I gathered data for the two current TI-Nspire models, the TI-Nspire CX, and the TI-Nspire CX CAS. Here the prices were more stable, possibly due to the fact that there have been no new Npsire models for a couple of years. 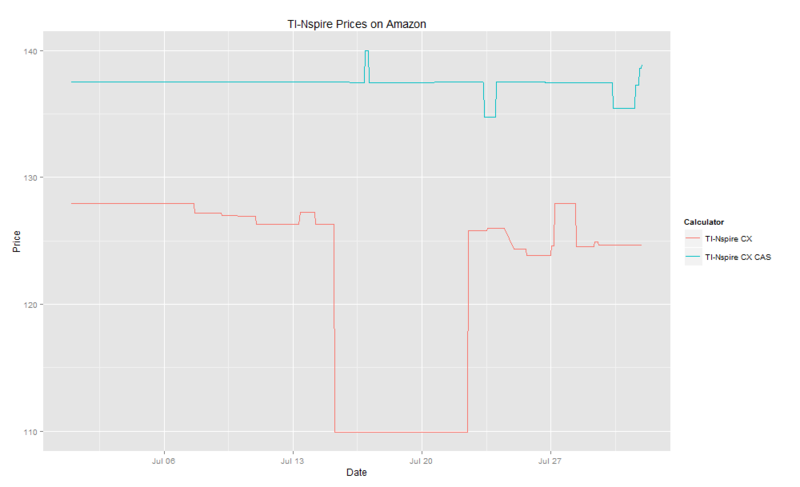 Even here, though, we see not only minor variation in price, but a week long drop in price for the TI-Nspire CX of almost $20, behavior more like one would expect to see with a brick and mortar store putting an item on a temporary sale. See the current Amazon prices on the TI-Nspire CX, TI-Nspire CX CAS, or read my TI-Nspire CX review. Here is a comparison of 3 other arguably lesser known, but in my opinion, excellent models, the TI-89 Titanium, Casio Prizm, and HP Prime. 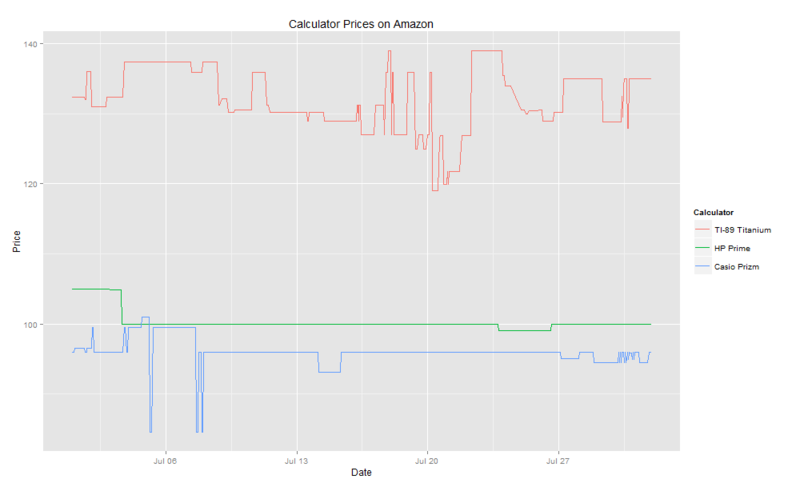 The Prime had a very stable price, spending most of the month at $99. One could have saved $16 by purchasing the Prizm at the right time ($101 vs $85 at the low). And much like the TI-84 CE, the TI-89 Titanium performs much like a tech stock IPO, with significant hour by hour variability. See the current prices on Amazon for the TI-89 Titanium, HP Prime, Casio Prizm, or read my reviews of the 89, Prime, or Prizm. I hope to have my Twitter feed posting major Amazon price drops on these calculators within the next couple of weeks, so if you are curious about that, follow @techpoweredmath.